Okay, the holidays are behind us and it’s time to get serious about your blood sugar health and the over-indulgence. Because diabetes is so prevalent and serious, this report is a bit longer than most because understanding what you can do naturally to avoid and control blood sugar is literally life-saving! I LOVE pizza but stay away from it most of the time because I avoid gluten. My newly created recipe is high in protein and fiber, gluten-free. Other alternative pizza crust recipes left me...well...wanting the "real" thing. I soaked the quinoa and it combined beautifully with the water in my food processor to create a pancake-like batter. It bakes to a beautiful golden, chewy crust. NOTE: The quinoa MUST soak overnight to reach its full crust consistency. 1: Place the quinoa in a small bowl and cover it with water. Let the quinoa soak overnight or for at least 8 hours. Drain and thoroughly rinse the quinoa (this will prevent any bitterness in the crust). Place the quinoa, 1/4 cup water, baking powder, and salt in the bowl of a food processor. Process until a smooth batter is formed, about 2 minutes, scraping down the sides of the food processor as necessary. 2: Line an 8 or 9-inch round cake pan with parchment paper (it may help to spray the pan with cooking spray first, so that the parchment sticks), and then spray the parchment paper with cooking spray. Pour the batter into the pan and smooth with a rubber spatula. 3: Bake the crust for 15 minutes at 425°F. Remove the parchment paper from under the crust. 4: Flip the crust over and return to the oven for 5-10 more minutes, or until golden and the edges are crispy. 5: Remove from the oven and add sauce, cheese, and toppings of your choice. I topped mine with 1/4 cup of my Anti-Inflammation Mock Tomato Sauce (see recipe on my website at www.gloriagilbere.com), 2 oz. fresh mozzarella cheese, and a handful of fresh basil leaves. Return to the oven and bake for another 10 minutes, or until the cheese is melted. For a great healthy variation, top with your favorite ground meat (I use sautéed ground bison in onions and garlic) and top with fresh arugula, spinach, or kale. NOTE: I ALWAYS drizzle my pizza with some balsamic vinegar glaze (comes in plain and flavors like garlic, fig, etc. )....fig is my favorite! 6: Cut the pizza into four wedges, and enjoy! 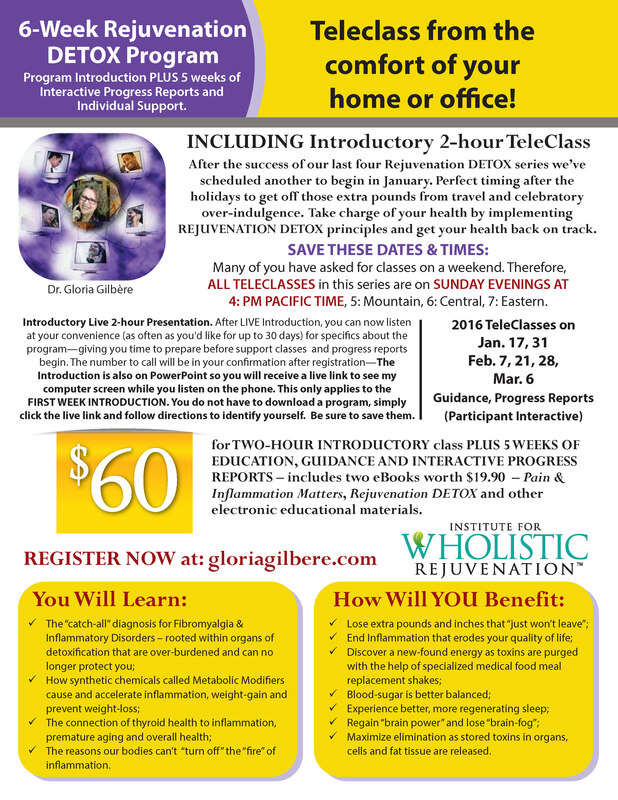 It will soon be a New Year and the perfect time NOW to make a commitment to yourself to Etch a Path to a New You through Wholistic Rejuvenation DETOX. No excuses, you participate in the TeleClasses from the privacy and convenience of your home or office. 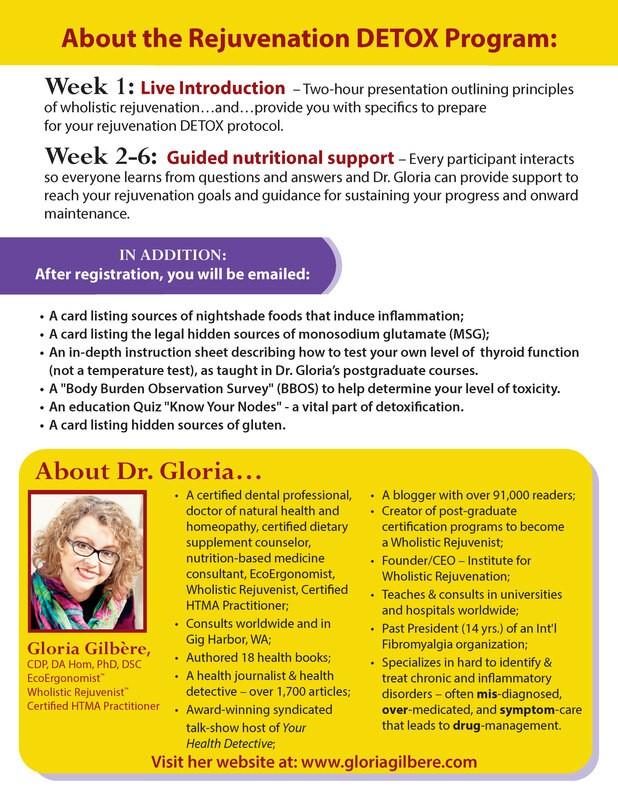 The program is a 2-hr Introduction with a PowerPoint and you don't have to download a bunch of software programs, you just click on the link in your registration confirmation and call the phone number listed as well...The next 5 sessions are to support your detox by answering individual questions or concerns, this way all attendees benefit from questions and my replies; these 5 weeks are about 1 hr. in duration. to see the brochure, Page One. to see the brochure, Page Two. SPACE IS LIMITED due to the PowerPoint software I use, don't delay, REJUVENATE in 2016!